Wild Brews by Jeff Sparrows is a book bent on demystifying funky beers. It covers everything from the classic sours like Gueuze and Flanders Red, to the modern style busting creations of breweries like Lost Abbey, Russian River, and De Proef. It does not cover the two German origin sours, Berliner Weiss and Gose, which the author states are outside the scope of the book. As you can see from the cover this is one of my most used and abused books. It does a good job covering the basics, but it also has enough in-depth information and rare situation suggestions (like how to select an oak barrel) that I keep coming back to it even after years of playing with Brett, Pedio, and Lacto. Content: The book is not divided by style as you might expect, instead each chapter covers an aspect of the beers or their production. The book starts out with a quick review of the style guidelines for Flanders Red, Flanders Oud Bruin, Lambic, Gueuze, and Fruit Beers. This chapter gives a nice overview, but probably won't be too interesting if you have read through the BJCP style guidelines or drank your share of sours. The book then goes on to the history of sour beer in Belgium (touching on some obscure styles like Faro). One of the most intriguing stories is about how Alexander Rodenbach (the founder of the brewery of the same name) studied brewing in England. You can still see the similarities in the two countries beers when you look at two classic barrel aged beers like Gale's Prize Old Ale from England and Goudenband from Belgium. Both are malty, low on bitterness, dark, and characterized by their mildly funky flavors. The book then goes onto a chapter about drinking the great variety of wild beers available today. This section is made up of small profiles of breweries/brewers and of their funky beers. It covers Belgian producers both big and small, then moves onto the other Europeans, and finally Americans. There is some great history on the Belgian brewers and blenders, but the American industry is moving so quickly that this section is already missing some things. I would also have liked to hear more production advice from the brewers, many of whom Sparrows talked to while writing the book. Next is a section on all of the microbes that play give sour and funky beers their sour and funk. There is lots of great stuff (much of it adapted from Raj Apte). I especially enjoy the chart of the different esters Brett can make, and the horrific descriptions of what some of the acids taste like before they are esterified. For example Isovaleric Acid has a rancid or horsy aroma, but combined with a molecule of ethanol to form Ethyl Isovalerate it has a pineapple or Tutti Frutti aroma. It even gives some time to the minor players like enterobacteria and oxidative yeasts, besides Brettanomyces, that generally are not talked about. There is a handy chart at the end of the chapter that gives you each microbe's ideal conditions. The bulk of the book is then taken up with the details of how to go about producing the beers. This includes grist composition, mashing options, hops, barrels (and barrel alternatives), spontaneous fermentation, controlled inoculation, blending, bottle conditioning, and so forth. There is a load of great information here both on how professional brewers do these things and suggestions for the best ways to replicate those methods/conditions at home. This is also one of the only print sources with an in depth discusses doing 100% Brett beers. There are lots of great tips that are applicable if you are looking to make any classic sour beer style or your own wild creation. Accuracy: Despite only being 4 years old, the information about commercial beers is starting to get a little dated (some of the beers are no longer produced and there are many new ones are not mentioned) and there are some minor mistakes (describing Mo' Betta Bretta 100% pilsner malt for example). That said most of the commercial information is still perfectly accurate, or at least gives you a good reference for the way things were in 2005. I would also quibble (much as I did with How to Brew) over some minor technical points, for example the oxygen permeability numbers. I just don't see any way that Flanders Reds could have so much more vinegar character than Lambics, yet get so much less oxygen (acetobacter needs oxygen to convert ethanol to acetic acid). I suspect that because the beer does not touch the tops of the giant wood vats the wood there does not swell and thus lets in more O2 than the math suggests. Other than these few minor issues the book is very accurate, which is a good thing because when you are aging a beer for 12 months you'd be pretty upset if it didn't turn out well. Recipes: At the end of the book there are 10 recipes. They cover all of the traditional styles plus some of the more modern American/Belgian sour beers that have been invented in the last decade. They are written in a rather loose form (giving a percentage of the different malts, target IBUs, mash temp, finishing hop suggestion, and ballpark figures for the aging time/temp) which I like. I also like the optional suggestions for blending or adding fruit that are provided with most of the recipes. Several of the recipes on my blog are influenced by these recipes (Lambic, Cuvee Tomme Clone, and Flanders Pale), but with my own tweaks. Even for recipes that I've gotten from elsewhere or crafted myself I often look at the optional suggestions when I am considering adding fruit or blending. In my experience brewing sour/wild/funky beers is more about technique than it is the malt or hop bill. Many great sour beers are made using a brewery's standard house beers as the base, it is the application of microbes, time, wood, and blending that are the most important in determining how good the finished beer will be. So even if you want to make your own recipes or get them for somewhere else Wild Brews will have the information to help you to brew those beers better. Readability: This is where this book can fall a bit flat. There are several spots where information is repeated because of the way the book is structured (particularly between the Beer Souring Microorganisms and Wild Fermentation chapters). I also find it annoying to have to read through every chapter to pull out the information about one style. There is also some information that seems out of place (like the section on fruit coming in the production chapter before the sections on mashing, boiling, and fermentation). It may also be a bit too technical in some spots for a person who is looking to brew their first sour beer. That said this is not a book aimed at people just brewing their first batch of beer, so I don't think it should be dumbed down. I enjoy the discussion about ester formation and the charts about when different microbes are dominant in the wort in a traditional lambic fermentation, but things like this probably are not necessary for someone with a moderate interest in brewing sour beers. 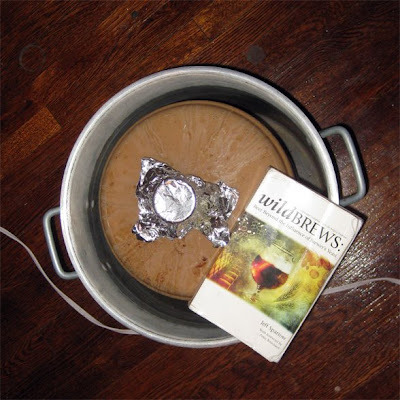 Overall: Wild Brews is a great book that every person who is interested in brewing funky beers should pick up. I would even suggest it to any beer lovers or homebrewers who have an interest in drinking sour beers, but no intent on brewing them, because most of the book focuses on how different commercial breweries practice their craft. It's because of this book that I hunted down and visited Bristol Brewing Company and New Belgium Brewing Company (the latter more than once...). I also managed to swing by Russian River Brewing Company (I still have a couple of bottles of some of their "*ation" sour brews) at one point. Sadly, the place the book mentions in Austin, TX, appears to have burned down and been replaced by a chain hotel building or something of the sort. I have Brew Like a Monk and Farmhouse Ales, and may soon get Wild Brews. I think I'm going to need to by a few more carboys!